Haddon Hall is an unspoilt, fortified medieval manor house dating from the 11th Century, and is the home of Lord and Lady Edward Manners, whose family have owned it since 1567. A regular star of big and small screen, Haddon Hall is steeped in history and remains one of the Peak District’s greatest attractions. Haddon Hall is located alongside the River Wye just outside Bakewell, the capital of the Peak District National Park. From around 1087, the house was held for over a century by William the Conqueror’s illegitimate son, William Peverel, and his descendants, before it passed - through marriage - to the Vernon family in the 13th century. The 16th century saw the property change hands once more when, again through marriage, the Manners family took hold of Haddon. In 1703 the Manners became Duke and Duchess of Rutland, and from then on their lives centred on the spectacular Belvoir Castle in Leicestershire. As a result, Haddon Hall stood abandoned and neglected for more than 200 years, between 1702 and 1920. Consequently, Haddon Hall escaped the widespread architectural changes of the 18th and 19th centuries, and it was in the 1920s when the 9th Duke of Rutland, John Manners, finally awoke to the importance of Haddon Hall after a visit to his family’s former abode. Alongside his restoration architect Harold Brakspear, Manners commenced practically a lifetime of meticulous and painstaking restoration. The house today is open to visitors from April to October, with a whole host of special events being staged throughout the season. Admission is £9.50 for adults, a pound less for concessions, while kids get in for £5.50. Discounted family, group and school tickets are all available. The doors reopen for Christmas every year (for 2011 the house is open between December 7th – 21st), and the Hall positively shimmers with traditional decoration and lighting. Roaring open fires, traditional Tudor music and carol services all contribute towards a uniquely timeless and magical festive atmosphere. Haddon Hall’s relatively unaltered state paints an accurate and illustrative picture of the past and as such is regularly featured in historical film and television drama – perhaps most notably the 2005 remake of Pride and Prejudice starring Keira Knightley and Dame Judi Dench. Most recently the house featured in Cary Joji Fukunaga’s 2011 adaptation of Jane Eyre, starring as Thornfield Hall for a second time following the 1996 version. 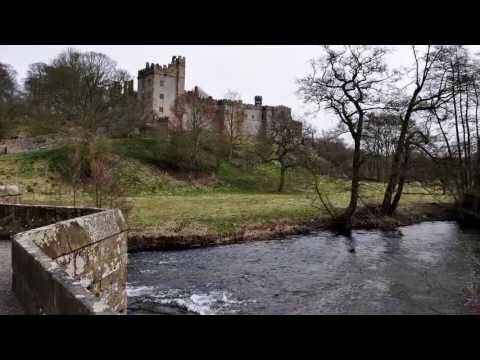 It has often been suggested that Jane Eyre’s author, Charlotte Brontë, based Thornfield on Haddon Hall, although this has never been entirely corroborated. But after three notable depictions of Thornfield Hall, Haddon has undoubtedly become synonymous with the setting for Brontë’s classic. The Peak District is blessed with around a dozen stately homes. And although largely overshadowed by its more illustrious neighbour Chatsworth House, Haddon Hall is said by many experts to be singularly the finest example of a medieval manor house in existence in England. Impeccably preserved and thoroughly medieval – replete with gargoyles and embattled walls – Haddon Hall represents a magnificent journey back in time and provides an authentic view of ye olde English days of yore.